Injury prevention | Blackhill Bounders Running Club. Running injury prevention is a very important topic, especially if you are training for longer distances like a half or full marathon. There is no one reason why runners get injured, but there is a pretty consistent interaction of factors that play a role in most runner injuries. Not enough rest between efforts, sessions or even a week’s training. Returning to training too soon. It is important to warm up before running, as this prepares your body for exercise. It also helps you avoid injuries, as warm muscles are less likely to tear or strain than cold ones. The functional flexibility needed is activated through an active, dynamic warm up, using appropriate mobilisation exercises. *Traditional static stretches do not provide this functional flexibility and may actually put the muscle to sleep something you definitely do not want in the warm up. Start your warm up by jogging for about 800 to 1000m and include some gentle easy exercises. Finish with some strides and running drills to get your body used to running. These drills prime the muscles into a perfect state for exercise economy of your exercise can be greatly enhanced if this is completed correctly. Inchworms: Start in push up position and walk your feet as close to your hands as possible. When you can’t go farther, stop and walk your hands out in front to return to push up. Come down on stomach and arch your back up for a spine stretch. 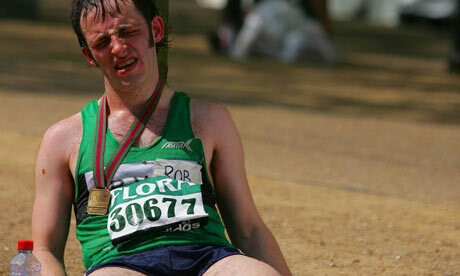 Always remember to cool down at the end of your running. Start your cool-down by reducing your pace near the end of your run this will help flush any lactic acid out of your muscles. Move onto some easy stretching exercises you should stretch gently for about 10-12 seconds and then relax before repeating it. Stretching is neglected by many of us which is a shame as it has the potential to improve our performance, prevent injuries and keep us supple. There will be a few reasons why we don`t stretch one of them might be a self conscious factor as you worry about what people will think of you, another that you don’t really know where to start and how to do it properly, and lastly that you don’t understand exactly why it is so important to include stretching as part of your workout. Not only does it help return your muscles to a pre-exercise length but it improves and maintains range of motion in your joints and helps with your flexibility. Frog stretch: Stand with feet about shoulder-width apart. Turn toes out and squat down as low as possible, keeping heels flat on the floor. Press knees open with elbows. A few rules when it comes to stretching. * First, pain is never acceptable. * Stretching should be comfortable and relaxing, never painful. * If something hurts, you’re not in the right position or you’ve stretched too forcefully. If you are not sure on pre or post run exercises and stretching then speak to one of the coaches or leaders for assistance.